Snow fell early Monday morning, coating the ground and providing a wintry look to Christmas Eve day. 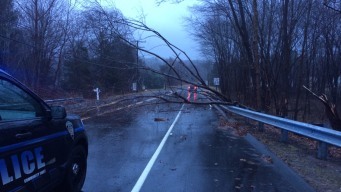 Heavy rain and strong winds arrived early Friday, soaking Connecticut and making travel tough on a very busy travel day. A few towns where temperatures are around freezing could have some slippery spots Monday morning. Snow showers and flurries are moving through the state. The stretch of unseasonably cold weather continues through this week. High temperatures will start off this week in the mid- to upper-30s and actually fall toward Thursday, where we'll end up in the low-30s. If you think today is cold well just wait. Even colder air is on the way for Friday and the weekend. NBC Connecticut Meteorologists are tracking moderate to heavy rain for your Sunday. 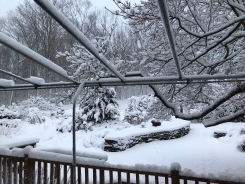 There are several school days this morning because of snow in parts of Litchfield County and there are also several issues on the road.